Cell Sorting or FACS (Fluorescence Activated Cell Sorting) can be used to isolate high purity fractions of cells in suspension. The cell sorter combines multi-parameter flow cytometry with the ability to sort individual cells into several distinct populations. Sterile, functional cells are collected and can be returned to culture, utilized in functional assays or further characterized through genomic, proteomic or similar analysis. Up to 4 populations, defined by Boolean gates, can be sorted simultaneously. Alternatively, a single population can be deposited directly into a variety of cell culture plate formats (e.g., 96-well plates). The number of cells/well can be specified for each well, facilitating cloning, single cell experiments or limiting dilution experiments, where graded numbers of cells are plated. High speed sorting allows for the processing of large samples, as millions of cells can be sorted in a very short amount of time. Cells can be sorted to optimize purity or recovery. For information concerning sorting of potentially biohazardous samples, please see the BSL2+ Safety Manual. For most cell lines, a 100 micron nozzle is needed, which reduces throughput by at least 70% – adjust calculation accordingly. Attempting to sort out a sub-population (5%) from your cell line. The number of cells you can provide is unlimited, and the viability is 90%. Collection rate (maximum) = 0.9 (viability 90%) x 0.05 (expression 5%) x 50(10)6 events/hour = (0.9) x (0.05) x 50 million cells/hour = (.045) x 50(10)6 = 2.25(10)6 = 2,250,000 per hour. 100 micron nozzle reduces by at least 70% - adjust calculation accordingly. Recovery of 5(10)6 total =[5(10)6 Ã· 2.25(10)6] = 2.22 hours of sorting, at minimum. Add an additional 45 minutes to sorting time to set up the machine. However, please assume that something might go wrong, and you will need twice the number of cells, and it will take twice as long. REMEMBER: 4 SEPARATE POPULATIONS CAN BE COLLECTED AT THE SAME TIME. Bring controls and samples in 12 x 75 mm sterile; snap-cap; POLYPROPYLENE tubes, with no more than 5% serum. The control(s) only needs to be 300 uL final volume, with at least 300,000 cells. Sample should be re-suspended at a concentration on 30-40(10)6 cells/ml. For each tube for collecting sorted cells, fill the tube ¼ full with 50% serum/media. You may use either 12x75mm tubes or 15 ml tubes. For maximum recovery, fill collection tubes to the top and let sit 30 minutes before spinning them down. First time users or experienced users with a new project should contact Michael Meyer before setting up an appointment. 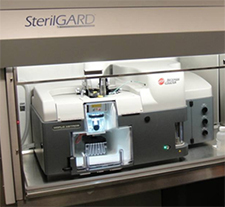 The Beckman Coulter MoFlo Astrios is a 5-laser, high-speed (10,000-20,000 cells/second) sorter capable of 6-way sorting, plate deposition, and single cell sorting. Biocontainment in a custom designed Class II Baker cabinet permits sorting of live human and retrovirus-transfected cells. The sorter can be configured to suit various excitation and/or emission needs. All samples must be in single cell suspension. Cells should be filtered through a <70 μm nylon mesh filter to prevent clogging the nozzle if the cell size is less than 70 μm. Sample may contain 1-3% FCS, or <=0.2% BSA. Cell concentration ideally should be at least 1x107 cells/mL and can be up to 5x107 cells/mL for non-adherent cells (low cell concentrations slow down sorting). Samples can be in a variety of tubes; ask the staff if you are unsure whether or not your choice is appropriate. For the purpose of compensation for multicolor analysis or sorting, you must bring an unstained control tube plus single color stained tubes for each fluorochrome (>5% positive). Ask us about using IgG capture beads (BD CompBeads, Cat # 552843) instead of cells for single stained controls. No radioactive material. The facility does accept unfixed human or non-human primate lentivirus-transfected cells, but investigators must meet with and discuss these experiments with facility staff. Please make an appointment if you need to perform a biohazardous sort. Tubes: 12 x 75mm, 1.5ml, 15ml or 50ml. Plates: n=6, 12, 24, 96 (include PCR plate), 384 well or custom size. Fill collection container (~10% of volume) with desired collection medium. If collecting cells for molecular work, please contact Michael Meyer to discuss collection conditions to optimize your recovery.